You love the smell of commerce in the morning. But for you, morning doesn’t mean 2am. If you’re like me, you’ve been sick of Black Friday since just about the time it ended last year. Whatever it is that drives people to line up outside a big box store for hours (if not days) on end – just for a good deal on an unnecessary item – is completely beyond me. We’ve even remembered to include discounts on some gifts perfect for the four-legged members of your household, including 10% off ZeroWater pitchers that keep water tasty and Culligan shower filters that keep coats shiny. Both are Clark the Clean Water Dog approved. All deals are good through the end of Cyber Monday, and all products are perfect to add-on to that water filters order you need to make, anyway. You can see all the deals we are offering this year by clicking on our Black Friday flyer above. 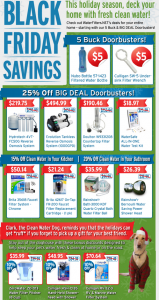 If there is something else you are looking for this year – whether it’s a stocking stuffer or big gift for someone you love – or just a water filter you need to replace – I would encourage you to call our customer service department at 1-888-801-PURE (7873) so they can help you find what you need.